Do you ever find yourself needing to sit down and play a nice relaxing game that you can unwind to? 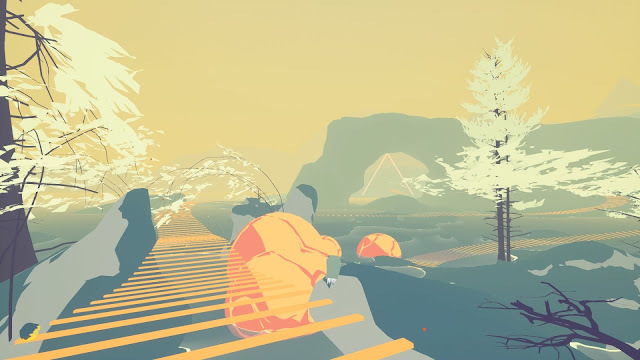 I know I do especially after a stressful day or when my heart rate is up after playing something frustrating (I have a heart condition), Shape of the World is the perfect game for this, the surroundings and music make you feel like you have drifted into another world where you can explore and take in each unique and beautiful creatures around you. 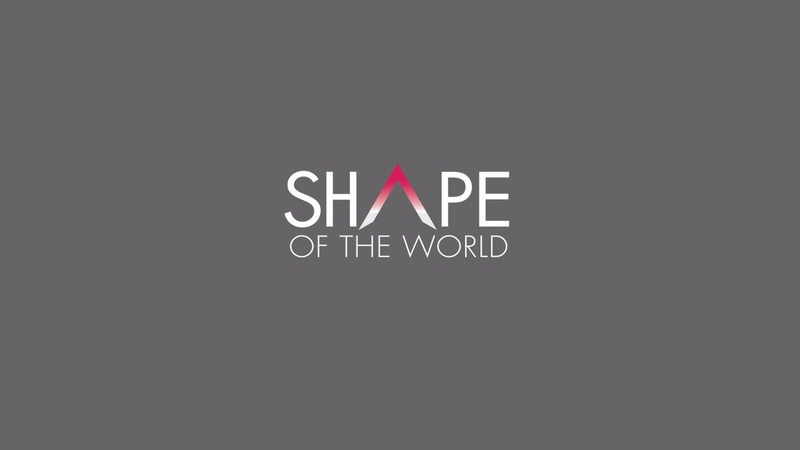 I understand not everyone is keen on a game which is solely based on exploring and walking but I think Shape of the World is an exception due to how laid back it is, I find some other walking games far too slow but the pace of this game was perfect. 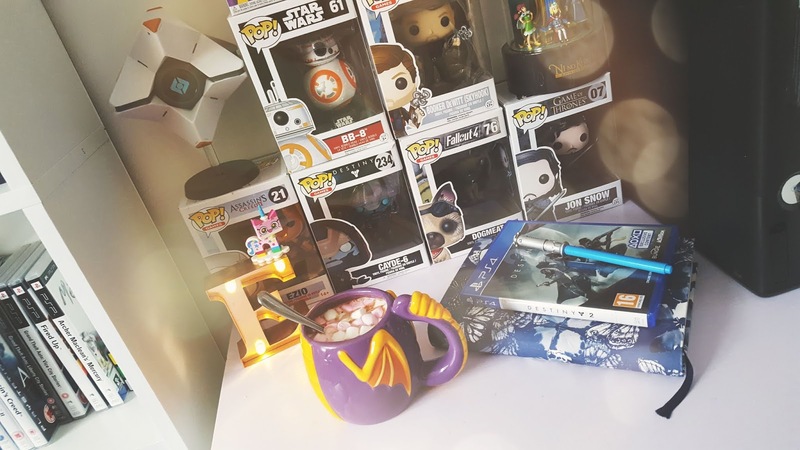 As someone who suffers from anxiety, I would find gaming difficult at times and I'm always on the lookout for something to help with how anxious I feel, Shape of the World made me sit back and take in another world where I didn't have to think about my worries it was an escape from all of that. 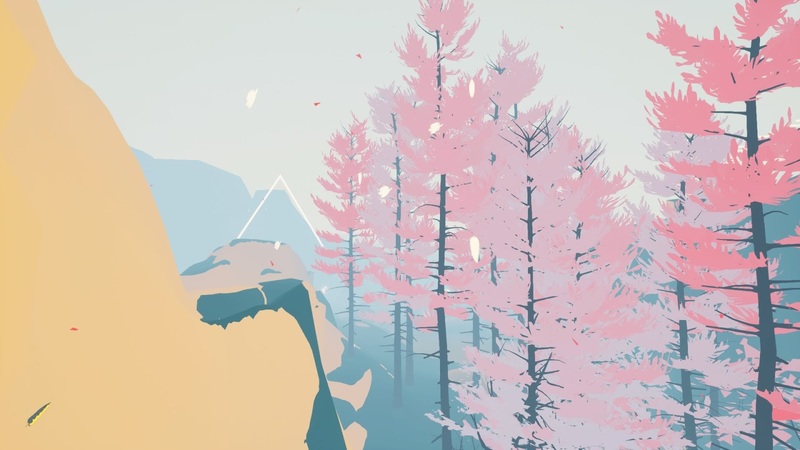 The purpose of the game is very simple, you need to travel towards triangles and in order to get to them you will need to find stones to press to make steps appear and help you get closer to reaching the triangle, along the way you will come across some very cool and abstract animals which you can interact with. You can also collect seeds along the way which you can throw and watch grow around you, I see it as making your own little mark in this bright world, you will find yourself getting lost at times but it's easy enough to find your way back to your target just by looking for a giant triangle. 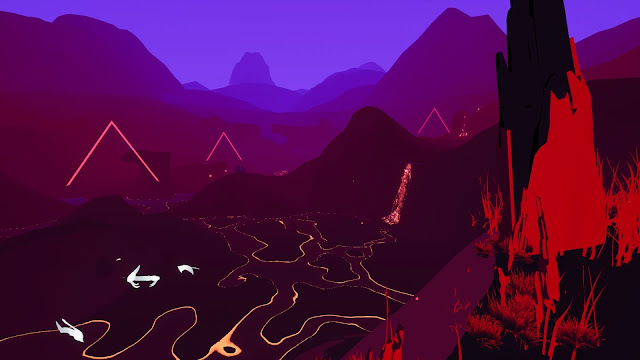 When you reach the big triangle it turns into a smaller one which transforms the environment around you into different colours and takes you to a different part of the world where you can collect different kinds of seeds and meet creatures that look oddly familiar, in each part of the map you explore you will come across at least one type of new creature. The game never explains what your purpose is or why you're exploring but you as the player know that you must explore this world you have been thrown into in order to discover new and unique parts of the world. If you're worried about how the game saves, the triangles you pass through act as a checkpoint so you can just turn off the game and when you come back to it you won't be halfway into a new environment but instead you will be at the gate of a new one ready to explore. You need to get lost in order to find your way back. My favourite part of the world to explore was under water, I was able to travel deeper into the water by clicking on stones and being pulled towards them or even travel towards the surface by doing this, I also liked that when you pressed on some of the stones water game out of them which helped the water level rise and helped you find an entrance to the next part of the map, this reminded me of Abzû (which I'm a huge fan of) and also partly reminds me of Flower, I'm a big fan of abstract games that focus on exploring and Shape of the World met my expectations as a game that's part of that genre. I had a lot of questions that I wanted to be answered when I first started playing this game, but as I got deeper into exploring I didn't care so much for an answer but more so what was waiting for me when I finished the game, each time I activated a staircase I got more and more hooked at wanting to see what beautiful scenery was waiting for me next. 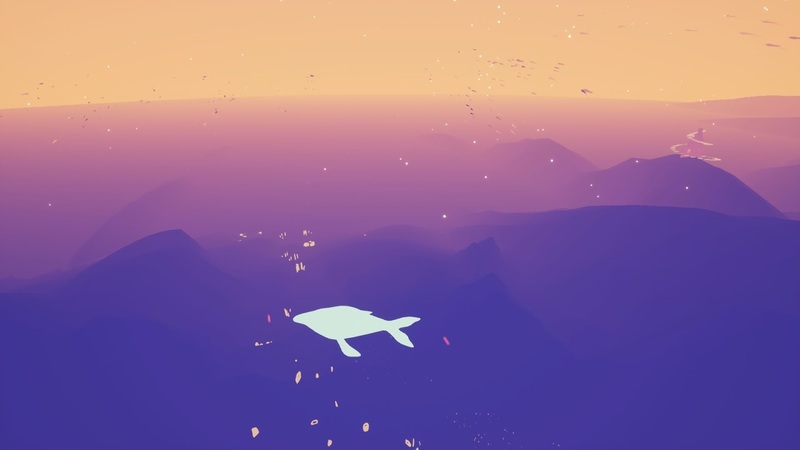 I appreciate art a lot and the use of abstract art in this game makes it unique and makes you look at the world in a whole new light, seeing what looked like a giant whale flying through the sky was so odd but magical it was like this world was a new kind of oasis for new creatures and plants to breed and thrive. 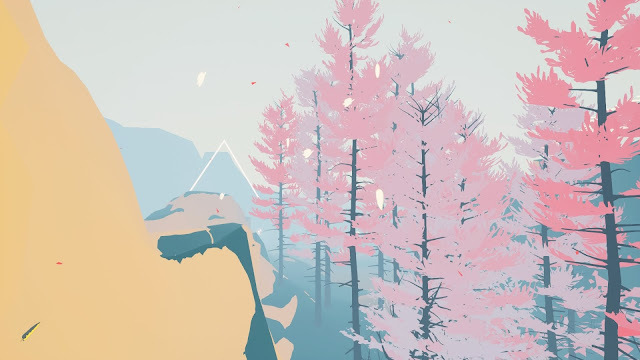 This game started life out as a Kickstarter three years ago, Hollow Tree Games have managed to create something that is very laid back and in a world full of seriousness you need some wind-down time. Shape of the World is 1-3 hours long, I got through it faster than I was intending but along the way was able to collect 7 trophies, I would love to try and collect them all and see if they are a challenge to get, there are 3 trophies for completing the game three times so it does force trophy collectors to come back and play it through more than once which is clever in a way. I would like to see a DLC to this, something that encourages players to do more in the world, perhaps where the player has to set out to find something hidden or help a creature but other than that I really enjoyed Shape of the World, although there isn't much you have to do it's a game that can most certainly help you unwind, I give this game 4/5. Have you played Fe on Switch? These have quite similar art styles. I haven't, I don't have a Switch yet but I'm going to check out the game play for it in a bit.